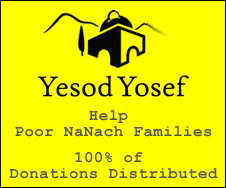 B"H the other day in the Nanach store in Tsfas, Kikar Hamaginim, SNS Nanach and myself were discussing how we can spread Nanach, SNS was saying how Rabbainu told us to reach out to the big souls. A little later a "big soul" walked right in to the store. A jew from Texas who had been running a multi-million dollar water plant, had found a web camera on the Western Wall, so he would pray facing it, once while praying his whole body started shaking.... I don't remember the whole story well enough, but the bottom line is that he gave his wife the company and child support and came to Israel. Right now he's studying the Baal Shem Tov, and soon B"H he'll be Nanach.